Predictive Analytics is a branch of data mining that helps predict probabilities and trends. It is a broad term describing a variety of statistical and analytical techniques used to develop models that predict future events or behaviors. The form of these predictive models varies, depending on the behavior or event that they are predicting. Due to the massive amount of data organizations are collecting, they are turning towards Predictive Analytics to find patterns in this data that could be used to predict future trends. While no data is perfect in predicting what the future may hold there are certain areas where organizations are utilizing statistical techniques supported by information systems at strategic, tactical and operational levels to change their organizations. Some examples of where Predictive Analytics is leveraged include customer attrition, recruitment and supply chain management. More focus on prediction rather than just information collection and organization. Sometimes in organizations it is observed that information collection becomes the end goal rather than using that information to make decisions. Timeliness is important otherwise organizations might be making decisions on information that is already obsolete. Understanding of the end goal is crucial by asking why Predictive Analytics is being pursued and what value it brings to the organization. Keeping in mind that if the tools are more accessible to business users then they would have a higher degree of appreciation of what Predictive Analytics could help them achieve. University of Pittsburg describes Decision Support Systems as interactive, computer-based systems that aid users in judgment and choice activities. They provide data storage and retrieval but enhance the traditional information access and retrieval functions with support for model building and model-based reasoning. They support framing, modeling and problem solving. While Business Intelligence according to Gartner is an umbrella term that includes the applications, infrastructure and tools, and best practices that enable access to and analysis of information to improve and optimize decisions and performance. These descriptions point to the fact that Decision Support Systems or Business Intelligence are used for decision making within organization. Interestingly, it seems like Predictive Analytics is the underlying engine for Decision Support Systems or Business Intelligence. What this means is the predictive models that result in Predictive Analytics could be under the hood of Decision Support Systems or Business Intelligence. It should be noted that organizations should proceed with caution with regards to the Decision Support Systems or Business Intelligence since if the underlying assumption are incorrect in making the predictive models then the decision making tools would be more harmful then helpful. A balanced approach would be to create expert systems where Decision Support Systems or Business Intelligence is augmented by human judgment and the underlying models are checked and verified periodically. As the descriptions above have indicated that the aim of Predictive Analytics is to recognize patterns and trends that can be utilized to transform the organization. This requires organizations to firstly educate themselves on what value they want and what can be derived from Predictive Analytics. Predictive Analytics is about business transformation and it needs to show what value it brings to the organization. In this regard, we have to assess people, processes and technologies of the organization in terms of current state (where the organization is right now) and future state (where the organization wants to be). Typically, this revolves around Strategies, Politics, Innovation, Culture and Execution (SPICE) as shown below. The assessment of people for Predictive Analytics means to understand what users will be leveraging Predictive Analytics and if they understand that simply relying on Predictive Analytics is not enough but in order to have an effective system they need to be part of the system. This means that the analytics insights need to be augmented by human expertise to make intelligent decisions. The assessment of processes for Predictive Analytics entails looking at how organizations make decisions right now and how future decisions would be made if Predictive Analytics is put into place. This includes having appropriate governance structures in place. The assessment of technology entails looking at what technologies exist within the organization and if they could be leveraged for Predictive Analytics. If not then looking at what Predictive Analytics products are in the market that would work for the organization and are they flexible enough in case the underlying assumptions for the predictive models change and when predictive models become obsolete. 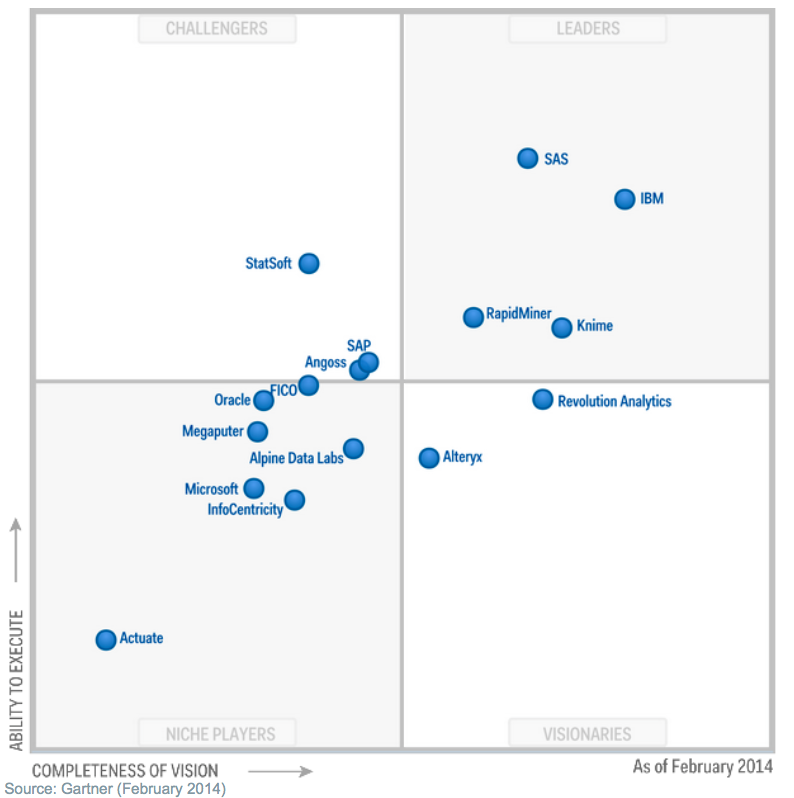 Gartner has been publishing their Magic Quadrant on Business Intelligence and Analytics Platforms since 2006. Due to the increased importance of Predictive Analytics in the marketplace, Gartner decided to create a separate Magic Quadrant for Advanced Analytics Platforms which focuses on Predictive Analytics and published its first version on February 2014. Since it is the first version of the Magic Quadrant, all vendors listed are new and no vendors were dropped. As we can see from this Magic Quadrant that it includes well-known vendors but also vendors that are not as big or as well-known. It is interesting to note that open-source vendors such as RapidMiner (a Chicago company) and Knime (a European company) are in the same Leaders Quadrant as well-established vendors such as SAS and IBM. While there are some issues with these open-source vendors as stated in the report but perhaps this Magic Quadrant is also an indication of where the next generation of analytics would come from. Due to the very nature of open-source, there are more opportunities for cheaper customization which would give the organizations the flexiblity to be as granular as they want to be. Ofcourse code stablity and lack of proper documentation are issues that organizations need to be cognizant about. Organizations may also want to “try out” these open source tools before they make a big commitment to propertary software to see if Predictive Analytics is something they want to invest heavily in. Industry How is Predictive Analytics used? While there are many examples of industries that have embraced Predictive Analytics but there are other industries that have not fully accepted it as a new reality. These industries have many excuses for not considering Predictive Analytics but typically revolve around scope, quality, cost and fear of the known. However, the tide might be changing for these industries as well since industry bloggers are beginning to insist how Predictive Analytics could be leveraged for competitive advantages. Predictive Analytics can come in handy in making organizations analytical and becoming a better version of themselves. However, Predictive Analytics can be a deal-breaker if organizations have attempted and failed in the past and for this very reason Predictive Analytics should start as a discussion first. This discussion should revolve around asking which areas need improvements and among other things determine if Predictive Analytics could be something that could help. After a successful Predictive Analytics initiative other areas could be potential candidates as well. An important thing to note is that Predictive Analytics is an organization-wide initiative that has touch points across the organization and thus the maturity of the organization has to be seriously considered prior to going on a Predictive Analytics journey. No matter how good Predictive Analytics can be for the organization but if the organization is not mature enough and it does not have the right governance, processes and feedback mechanisms in place then it might turn out to be another attempt at glory but nothing to show for it. Next Future Considerations for Alphabet Inc.